The 2017-18 Steel Bridge Team. Back row, left to right: Lawrence Taicz, Holy Ogden, Tommy Tang, Kyle Coit, Phil Yu, James Roney, Tim Dumais, Cody Filley, Alex Ilias and Joey Lasensky. Front row, left to right: Kiri Takanishi, Ashley Pigott, Martha Quigg, Melina Soto and Katarina Kubiniec. Photo credit: James Roney. 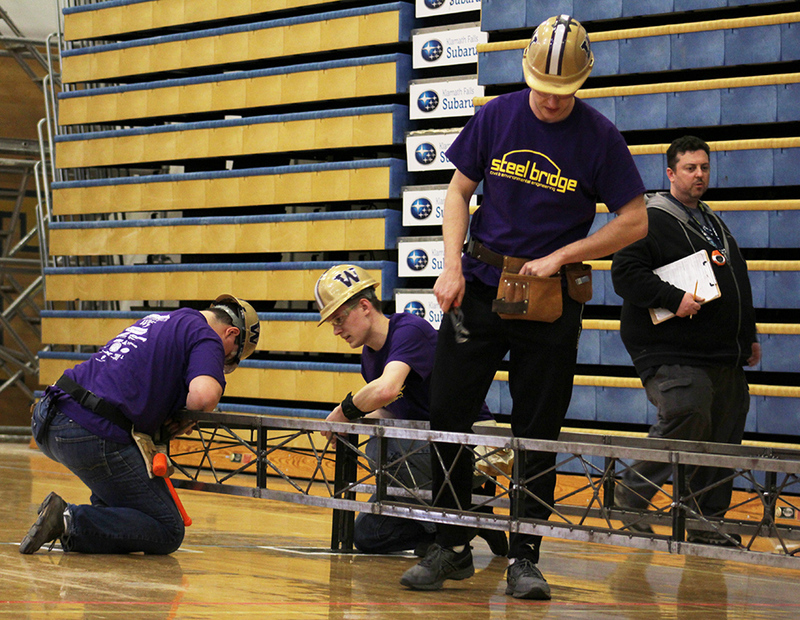 While it’s big news that the UW Steel Bridge Team is heading to nationals, the even bigger news is that this is the first time in more than 20 years! Competing against 16 other schools, the team took second place overall at the regional competition at the Oregon Institute of Technology in Klamath Falls, Oregon, on April 5-7. The team also took first place in the “construction speed” category after assembling their bridge in 8 minutes and 45 seconds. The team had an edge this year for several reasons, Quigg said. The bridge was designed to allow for quick assembly, featuring fewer pieces and bolts. The bridge also featured a double-deep span, rather than an arch shape like previous years, which was easier and faster to assemble at competition. Team members Alex Ilias, Cody Filley and Kyle Coit, from left, work together to add lateral bracing and tighten nuts and bolts. Photo credit: Lawrence Taicz. The team also began planning their strategy last year, sending several leads to the national competition to gather innovative ideas and tips. This “scouting” technique is common both in steel bridge and professionally, Quigg said. “From this trip, we took in dozens of new connection ideas, span shape and construction techniques,” Quigg said. Comprised of 20 members from various engineering disciplines, including mechanical, civil and electrical engineers, the UW Steel Bridge Team began designing their bridge in August 2017, with fabrication wrapping up in March 2018. The national competition will be held Memorial Day weekend, May 25-26 at the University of Illinois, Urbana-Champaign. Help send the team to nationals! To cover travel expenses, the UW Steel Bridge Team is working to raise $5,000. All support is greatly appreciated! Please visit their campaign fundraiser site. Watch the team assemble their bridge at regionals by viewing the video. Birds-eye view of display judging. Photo credit: James Roney.